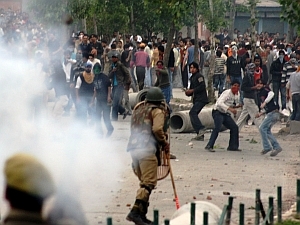 SRINAGAR, Jul 29 2011 (IPS) - Kashmir’s juvenile justice system is sorely deficient for a state ridden with a long, and often violent, separatist conflict that attracts youth, say lawyers and rights activists. Kashmir has no juvenile home or specialised detention centre and applicable laws in the state deem anyone older than 16 years of age to be an adult. The result is that young people, many of them under trial, are lodged in regular jails along with hardened criminals. “This is completely illegal as India’s Juvenile Justice Act (JJA) of 2000 clearly bars juveniles from being kept in regular jails,” Syed Faisal Qadri, a well-known Srinagar lawyer, told IPS. The JJA calls for a special approach towards prevention and treatment of juvenile delinquency and provides a framework for the protection and rehabilitation of children. This law, which conforms to the United Nations Convention on the Rights of the Child, is yet to be implemented in Kashmir. According to Qadri, the government’s attitude can be gauged from the fact that a decade after the passage of the JJA no move has been made to build homes or infrastructure for the detention juveniles as required under the legislation. Qadri’s charges and the frailness of the juvenile justice system were palpable during a flare up of unrest of the summer of 2010 when hundreds of young people, many as young as 14, were detained for allegedly pelting stones at the police. It took considerable effort on the part of the families of the minors and human rights organisations before they were granted bail or their detentions quashed by the courts. Mushtaq Ahmad Sheikh, 14, was arrested for alleged stone pelting in April 2010 and booked under the PSA. He was granted bail after eight days, but was rearrested in the same month and finally released in February 2011. “Mushtaq was innocent. He was made to suffer unnecessarily. He was only 14 years of age when picked up,” Mushtaq’s father, Ghulam Mohi-ud-din Sheikh, told IPS. Faizaan Rafiq Hakeem, 15, who was booked under PSA in February, was released only after the intervention of Amnesty International. Harris Rasheed Langoo, 15, was detained in November 2010, despite being granted bail twice. Murtaza Manzoor, aged 17, was released after three months in administrative detention after the state high court intervened and declared his imprisonment unlawful. Though presently, no one below the age of 18 is in detention, scores of older youths are in jails on charges of stone pelting or violating prohibitive orders. In March, the state government released figures which said 5,255 persons, including 799 students, were arrested across the state for alleged stone pelting during the unrest that ran between January 2010 and February 2011. Of these 264 continue to be in custody. Mohammad Ayub, superintendent of the Srinagar district jail, told IPS that plans are being drawn up to build juvenile detention facilities and that he expects the age at which minors are deemed adults increased to 18 years.